Piazza del Popolo is a large square in Rome. Taking its name from the church of Santa Maria del Popolo which stands to the north of the square, Piazza del Popolo is an attractive and pleasant place to relax after a walk up the Via del Corso. 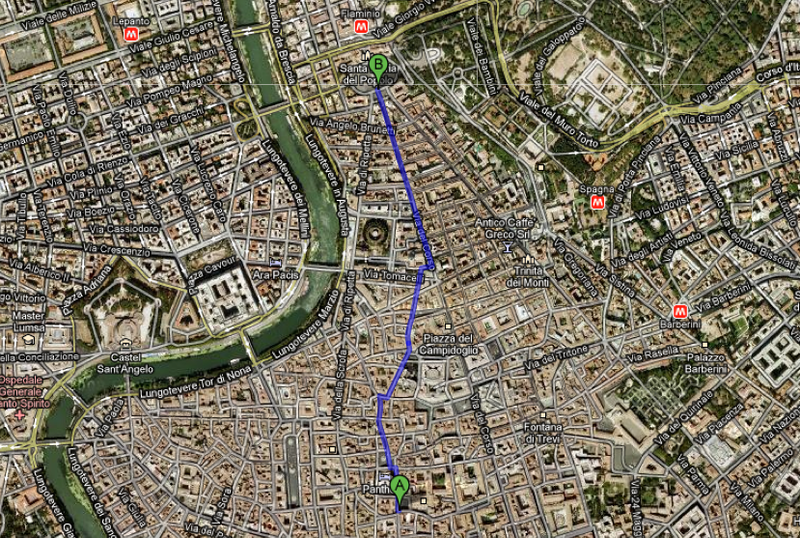 It’s also close to the park of the Villa Borghese. At the centre of the Piazza is an Egyptian obelisk, brought over to Rome by Augustus and originally installed in Circus Maximus. The four fountains at the base, in the shape of lions were added by Giuseppe Valadier in 1818, replacing the original fountain (which was relocated several times before eventually settling in Piazza Nicosia). The Porta del Popolo at the north edge of the piazza is a reconstruction of the old Porta Flaminia, a large gate in the northern stretch of the Aurelian Walls that once ringed the city. The reconstruction was designed by Bernini in 1655 under the instructions of Pope Alexander VII, in order to welcome Queen Christina of Sweden to the city following her conversion to Catholicism. The church of Santa Maria del Popolo dates from the late 15th century, although it replaces an earlier structure from 1099. The facade was redesigned in the 17th century by Bernini. The church is well worth visiting for several impressive works of art including The Crucifixion of St Peter and The Conversion of St Paul, both by Caravaggio. There are also sculptures by Bernini, frescoes by Pinturicchio and the Chigi chapel, which was designed by Raphael. At the far side of the piazza are the twin churches of Santa Maria dei Miracoli & Santa Maria in Montesanto, designed in the 17th century by Carlo Rainaldi. Although at first glance they seem identical, there are subtle differences between the two churches, caused partly by the spatial restrictions of the two sites. Don’t miss a Piazza del Popolo visit by staying at Grand Hotel de La minerve 5 star Luxury Hotel in Rome.